Honestly, I'm starting to think that Pixar is incapable of making a bad movie. Sure, some of their titles - like Cars or Monsters, Inc. - have been less perfect, but the worse the original concept sounds (A robot picking up garbage that doesn't talk for an hour?) the better the end product seems to be. Such is the case with UP, one of the biggest movies of 2009, animated or otherwise. The films opens on a young boy named Carl, who finds his one true love (Ellie) as a child through their shared admiration of the legendary Charles Muntz, world adventurer extraordinaire. Carl and Ellie just know that, one day, they're going to be just like Muntz. In the meantime, the pair grow up, get married and have a grand life together… though that one big dream adventure is always just out of their financial reach. Before Carl knows it, he's 80 years old and all alone in the house he shared with Ellie, surrounded by construction vehicles. It seems he's also the only property owner who wouldn't sell out to a ruthless developer. But when an unfortunate incident occurs, Carl is left with only one option and he goes for broke, literally flying away in the hope of making the dream he shared with Ellie come true. Being a computer generated movie presented in a digital format, UP delivers a nigh-flawless image on Blu-ray, capturing all of the nuances of the best digital theatrical presentations. Rich colors pop, and the light diffusion filters the filmmakers used don't interfere with fidelity in the slightest. Individual dog hairs, feathers and even the fuzz on Carl's tennis ball-topped cane are exactly where they should be. You're going to see this disc playing on a heck of a lot of store displays this Christmas, as its a perfect spokesman for how good Blu-ray can be. The disc is no slouch in the audio department either. Its DTS-HD Master Audio track captures the squeak and shuffle of every balloon perfectly. One of the benefits of an animated film is the genre's ability to craft a sonic environment completely from scratch. This is one of the best ambient tracks in recent memory when it comes to keeping you constantly immersed in the film with sound alone. Though it's a little less packed than its predecessor, WALL-E, the Blu-ray version of UP still brings a pleasing collection of extras to the table. Its Cine-Explore video commentary, coupled with the Adventure Is Out There, is a cornucopia of information on the how's and why's of the film's creation. This isn't just a one-off EPK-style feature, but rather a careful record of how a giant spider web of ideas eventually solidified into a coherent film. It's carefully illustrated with stills and film clips galore. The theatrical short, Partly Cloudy, is joined by a new cartoon, Dug's Special Mission - a hilarious Looney Tunes-esque look at how Dug came into UP's story. The documentaries on Disc Two total an additional hour of bonus material, focusing on the design and animation of individual characters, from concept to final execution. You even learn about the creation and dressing Carl's house and Muntz's dirigible, as well as the film's score and Kevin's unique vocalizations. Next up, Married Life and The Many Endings of Muntz contain abandoned concepts for the film's prologue and ending. Finally, the BD-based extras conclude with a collection of trailers and other promotional material, a flash-style game and Pixar's usual audio and video calibration tools. 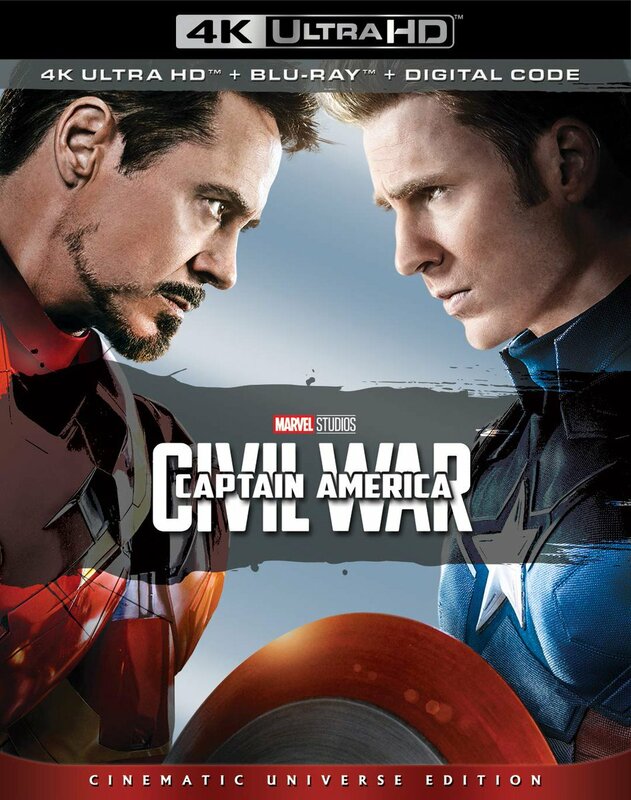 The package is rounded out with a separate DVD copy of the film and a Disney File digital copy version for your portable device. Overall, this is a stellar package of extras that's well worth exploring. There's very little crossover content between features, so every piece you click on is a new learning experience. 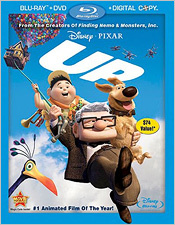 When I saw the first preview image of UP a few years back, I had the same reaction that the marketing department at Disney probably had: "A movie about an old guy in a flying house? Yeah that's going to sell some toys." Yet Carl's story is instantly relatable across every age group, from the heart-wrenching and beautiful prologue all the way to the end. There's enough action and fun for the kids, and a Thanksgiving feast's worth of character development and nuance for adults. Pixar has once again proven that if you make a good movie, audiences will come. I can't recommend this soon-to-be family classic more. With the current price wars going on at retailers, you can score UP on Blu-ray for as little as $10 in combination with Monsters, Inc.. If you miss this one… you must be off flying a house!